Another excellent MMS Band Concert! MMS welcomes Nadine Machkovech from Rise Together! Speaking about addiction and recovery! Power is out at MMS. That means our phones aren’t working but you can email and we can get a message that way. Congratulations to Monticello Middle School's own Jennifer Smith on being named the American Association of Chemistry Teacher's Teacher of the year! MMS will be offering open gyms for any girl in 6th, 7th and 8th grades. They will be on Thursdays from 7:00pm - 8:30pm starting this Thursday (3/28). The location is Moore Gym at the High School. MMS is hosting our annual Grandparents / Senior Citizens Day on April 3rd! Join us for a wonderful time. Please RSVP if you plan to attend. Monticello Middle School is hosting our annual Talent Show tomorrow, 3/15/19. The show will begin at 12:45pm. Parents / Guardians and family members are welcome to attend. We guarantee you will be entertained! Congratulations to Mrs. Brewer for being awarded a grant from EIEC! Looking for a great place to work? Consider MMS! The phones at MMS should now be working! Thank you for your patience! MMS phones are not working. If you can't get through to the school, please email Cody Tiedemann at tieco@sages.us. We're hoping the phones will be up again soon! Piatt County Spelling Bee! Go SAGES! Great crowd at the eighth-grade IESA Sectional Tournament tonight! MMS vs. St Jo! Congratulations to the 8th grade boys basketball team on their regional championship! We play Wednesday night at 6:30 pm at MMS! Sages fall to St. Jo 41-37. Congratulations on a wonderful season SAGES! After Monticello Middle School 7th grade boys up 9-2 over St. Jo! Changes at MMS (1/29/19) - Easier to Read: 7th Grade Boys Basketball Sectional has been postponed until Thursday at 6:30pm at St. Joseph There will be no detention or tutorial at MMS after school today Anyone who rides Piattran after practices will need an alternative ride, as Piattran is stopping services at 4pm today. No 8th Grade Volleyball practice tonight, 7th Grade will still practice. J.V. Scholastic Bowl practice has been cancelled tonight. Changes at MMS (1/29/19): 7th Grade Boys Basketball Sectional has been postponed until Thursday at 6:30pm at St. Joseph There will be no detention or tutorial at MMS after school today Anyone who rides Piattran after practices will need an alternative ride, as Piattran is stopping services at 4pm today. No 8th Grade Volleyball practice tonight, 7th Grade will still practice. J.V. Scholastic Bowl practice has been cancelled tonight. Here is the latest on cancellations and changes: - Tuesday 1/29 Wrestling Meet cancelled 8th Regional Game postponed to Thursday 1/31 at 4:30 We will continue to share / update information as we receive it. Due to the weather We have a few buses that are running late this morning. Saturday, January 19th and Sunday, January 20th - All events are CANCELLED and all district buildings will be CLOSED. - This includes MS Boys Basketball Regional, Varsity Wrestling, MS Volleyball, Fr Boys Basketball, Girls JV Basketball, Girls V Basketball, Open Gym with Coach Chumbley, Boys JV Basketball, Boys V Basketball, Travel Baseball and Softball, Spring Musical Rehearsal, Rec VB and Open Gym with Coach Jones. As of today, the buildings will open on Monday, January 21st. and events will be held as scheduled. Due to road conditions and the fog buses are running late this morning the purple bus is stuck in the driveway at this time all other buses are going to try and cover routes. Holiday Chorus Concert at MMS! MMS Makerspace is a happening place today! Don't forget...MMS Boys Basketball is hosting a game tonight vs. PBL! If you bring a jar of peanut butter or canned goods you will get into the game free! Come support the SAGES and the Eastern Illinois Foodbank! MMS wants to wish everyone a safe and happy Thanksgiving! Boys Basketball Practice - the practice scheduled for today (11/19) has been moved from Lincoln School to MMS from 3:30 pm - 5:30 pm. MMS is supporting Eastern Illinois Foodbank! We are doing a Day of Giving food drive through next Tuesday the 27th! We will have boxes in the office for students to bring any canned good and/or non-perishable food items. MMS is specifically looking to donate peanut butter to them, but of course anything will help! We will also waive the entry fee to tomorrow evenings MMS Boys Basketball home game, to anyone who brings in peanut butter or an item to donate! Due to wet, muddy, and snowy conditions behind the visitors bleachers as well as the large crowds expected on Saturday, fans and students should NOT bring footballs or other "play" items into the facility. Fans and students who bring footballs or other "play" items will be directed to return the items to their vehicles. Thank you for your attention and cooperation in this matter. Family Science Night is a hit at MMS! 7th grade girls basketball vs. St. Mats - tied after the 1st! Fundraiser cookie dough pick up is tomorrow (11/14) from 3:00pm-5:30pm! Don’t forget Family Science Night at MMS tonight! 6pm-7:30pm! 8th grade students sharing their coding projects! Honoring the missing and those that have served! USA Dunk! Athletes in the sport of thinking! 8th grade girls representing tonight! MMS 7th grade girls hanging tough! Great night for the boys basketball team at MMS! Seventh-grade won 48 - 28 over Oakwood. Eighth grade won 25 - 20 over Oakwood! Way to go Sages! Zero hour for some MMS Teachers! Family Science Night at MMS! MMS is hosting our first Dance of the 2018 - 2019 school year. Students must be passing all classes in order to attend! 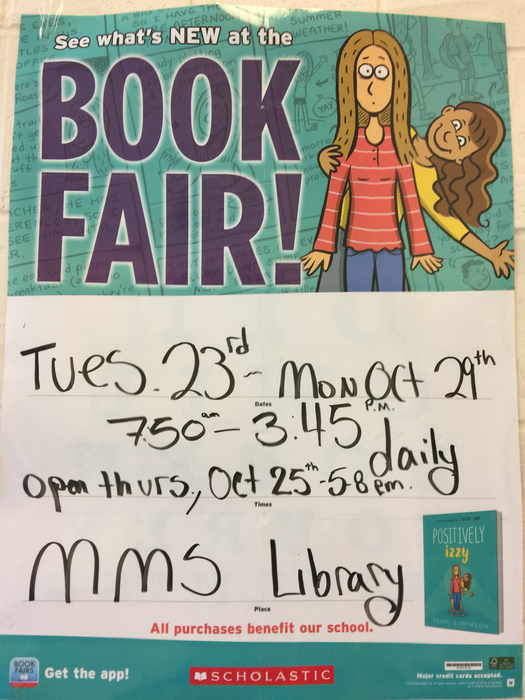 MMS Book Fair is coming! Great crowd at the 1st MMS Band Concert of the 2018-2019 School Year! At 3:15 PM this afternoon MMS will be having a "Parade of Champions" for the XC runners participating in the IESA State Meet tomorrow. Parents are welcome to come in and watch! Enjoying a wonderful night of music at MMS! MMS defeats Chatham Glenwood 4 - 1. They advanced to the championship game to be played at 4 PM! Go Sages! And so we begin! IESA State Tournament! What a great way to start off the day! High Five Friday! MMS is going to State! The phones at MMS are having issues. If you need to call in use the following number: 217-762-9080. Great job MMS! The drill is complete! Monticello Middle School is about to do a relocation lockdown drill. This is a drill just practicing in case something would happen in our district. This is just a drill! The cross country meet that was scheduled for today (9/20) at Mahomet has been cancelled due to the heat. MMS Fundraiser starts today! Be sure to find an MMS student to purchase cookie dough and/or magazine subscriptions! MMS dismissal time is 1:50 pm. MMS Parents/Guardians: Students cannot be signed out directly from the parade. They can be picked up by 11:30 or after the parade in the MMS office. Cooking up some SAGE Pride! Great event sponsored by 4H! Congratulations to the MMS Softball team for a great season! The team made us all proud! The baseball game vs. Edison at Zahnd Park tomorrow (9/8/18) has been canceled! It may be nasty outside but lunch is still fun! Good luck Cross Country as the travel to Champaign to take on Jefferson! Good luck to the girls softball team as the begin the IESA Regional Tournament today at 4:30 pm at the HS field! Go Sage’s! Boys Baseball Practice - MMS 2:30-4:15. If it rains we will go to pit in high school 3:00-4:30. Love this message! We ARE a Family! MMS continues to promote a culture of positivity! Just a reminder, MMS will dismiss at 2:20pm. There will be no Academic Support Program (formerly Tutorial) on early dismissal days! Stay Cool! The first two days of school may have been my best ever! Go Sage’s! Looking forward to the first day of school on Wednesday, August 22nd!